Colombo, February 10: Mahinda Rajapaksa, Leader of the Opposition in the Sri Lankan parliament and a former Sri Lankan President, has spelt out a list of do’s and dont’s for improving relations between Sri Lanka and India. 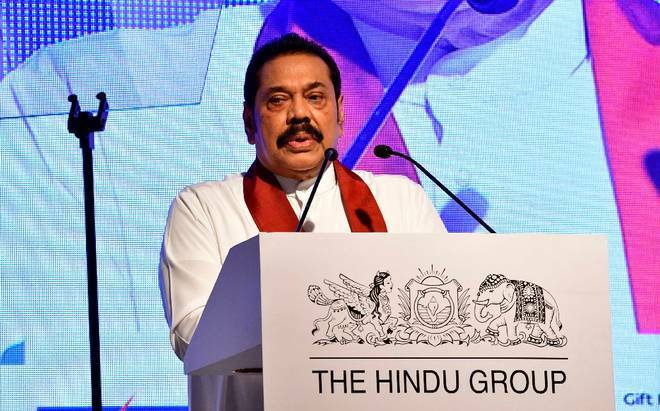 While being basically well grounded, Indo-Lankan ties do tend to veer off the track due to a lack of communication, misconceptions and unequal expectations, Rajapaksa told “The Huddle 2019” hosted by The Hindu in Bengaluru on Saturday. He said that constant communication between the two countries is a must to clear misunderstandings, defuse tensions, and build mutual trust based on transparency. To ensure this, there should be a Standing Committee comprising politically influential top persons drawn from the two countries. In this context he pleaded for the revival the “Troika” system set up during the final phase of Eelam War IV which enabled India and Sri Lanka to bring the war against terrorism to a successful conclusion. He further suggested that the new Troika system should have an all-encompassing mandate given the wide range of India-Sri Lanka relations. Rajapaksa went on to say that both sides must recognize and accord equal weight to each other’s sensitivities, national interests, economic imperatives and security concerns, because India and Sri Lanka are both sovereign nations with their own individual requirements. He also hinted that regime changes brought about by machinations have been detrimental to both countries. In this context, he mentioned the need to recognize the importance of political stability and continuity based on a strong leadership. The crux of Rajapaksa’s oration was the plea to revive the “Troika” system established during the war and give it a wide mandate. “You would recollect that a novel mechanism was in place during our time in government and in particular when we, as a country, fought against the most cruel terrorist organization in the world. The Troika, as it was known, helped in no small measure to build a bridge between the leaderships and the associated thought processes of our two countries and thus prevented any misunderstandings when Sri Lanka was engaged in a crucial war against terrorism,” Rajapaksa said. The relationship in the Troika was “friendly and casual” and that produced the desired outcome, he added. “I say without any hesitation, that India’s deep understanding of our government’s motive was a key factor that helped us eradicate terrorism. The respective leaderships were consistently and continuously briefed by the relevant Troika thus promoting the high level of understanding that was required to keep the relationship dynamic,” Rajapaksa said. It was in 2008, when Eelam War IV was in its critical last stage, that the then Indian High Commissioner in Sri Lanka, Alok Prasad, prompted by Sri Lankan Defense Secretary Gotabaya Rajapaksa, asked Lalith Weeratunga, Secretary to the then Sri Lankan President Mahinda Rajapaksa, if Colombo would appoint three people close to the President to constantly be in touch with a similar group of people in India to manage India-Sri Lanka relations as the war was on. As the idea came from his brother and Defense Secretary Gotabaya Rajapaksa, President Rajapaksa responded positively and promptly. He named Basil Rajapaksa, at that time Senior Advisor to the President; Gotabaya Rajapaksa, and Lalith Weeratunga, the then Secretary to the President; as his “Troika”. The two Troikas met frequently and informally, and sorted out many matters with ease, said Lalith Weeratunga in an article written later. “In my opinion, this initiative was more useful to Sri Lanka than to India because we were then in the thick of fighting the LTTE and it was crucial that India was fully aware of what the Sri Lankan government and its Armed Forces were doing. The personnel involved in the Troika could not only place facts with authenticity, but could also take decisions on behalf of their respective governments. Had there been any issue arising out of these discussions, any member in either of the teams could be on the phone to the leadership and obtain advice on further action,” Weeratunga wrote. “It is only through an active dialogue any misunderstandings could be averted,” Rajapaksa told his Indian audience in Bengaluru on Saturday. Rajapaksa obliquely alluded to the alleged Indian role in bringing about the regime change in Sri Lanka in 2015 in which he lost power. He said this was due to the lack of communication. Such a situation would not have come about if the Troika system was functioning, he argued. “Communication is such a vital factor that can be the make or break in strengthening our countries’ relations. Therefore, an open line of healthy and constant communication, should always be the focus even in the coming years,” he said. “In hindsight, the misunderstandings of the 1980’s as well as that of 2014, were aberrations that could easily have been avoided. It’s key that India and Sri Lanka evolve a mechanism to prevent these misunderstandings from taking place,” Rajapaksa said. Rajapaksa said that one of the cornerstones of good and stable bilateral relations is political stability based on a strong leadership. He was hinting that the strong government led by him had been replaced by a weak one from which neither India nor Sri Lanka have gained. “A strong government and political stability would always facilitate the blossoming of bilateral relations. In future bilateral relations between our two countries, strong political leadership would be a key factor towards a vibrant bilateral relationship,” Rajapaksa said. 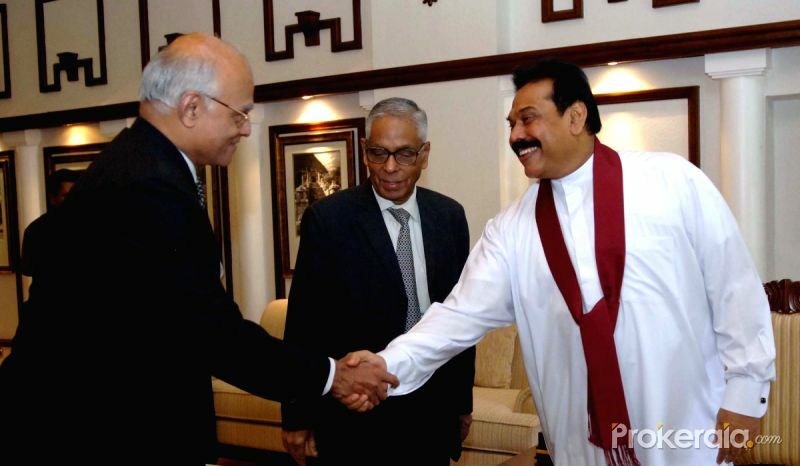 Rajapaksa pleaded for policy continuity even after regime change so that bilateral relations remain on an even keel. “Past experience has shown that the danger of disruption in our bilateral relationship arises in the immediate aftermath of changes of government. Such easily avoidable disruptions have had serious consequences for both countries,” Rajapaksa said. Referring to national security issues between Sri Lanka and India he alluded to the feeling in Sri Lanka that while India makes demands on Sri Lanka, Sri Lanka’s concerns are not being taken into account by India. “Since we are geographically in very close proximity, we have mutual obligations to ensure the security of each other. Often, we have heard the Indian leaders emphasizing the need for Sri Lanka to ensure that the Sri Lankan soil is not used by any third party that would pose a threat to India. Similarly, we too would want India to ensure that any threat from any groups operating within Indian soil does not pose a threat to Sri Lanka,” he said. Rajapaksa said that the Troika system should go beyond security matters to other areas of bilateral relations. “Through the Troika, we can go further to create forums and collaborations that take into consideration the pressing social, economic and cultural issues that affect our peoples, and elaborate on best practices and advances that we could learn from one another. The formulation of such an entity is foremost in my party’s plans for the future,” he said. One of the major concerns in Sri Lanka is a tendency of governments to alienate national assets like ports and airports etc. to foreign powers. Sometimes this is done to balance relations with foreign powers. If China is given a project to build a port in Hambantota, India must be given the Mattala airport or the Trincomalee port or the Eastern Container Terminal in Colombo. If China is given projects in Sinhala-speaking South Sri Lanka, India must be compensated with projects in the Tamil North. The concern among Lankans is that this way, there would be nothing left for Sri Lankans to own. Alluding to this issue, Rajapaksa said: “An important facet of economic stability is how we look at our national assets. No country, in my understanding, can achieve economic stability by disposing of national assets. I would emphasize that a policy advocating sale of national assets inevitably generates tensions among our people, and this has a negative effect on our relations with the country acquiring these assets, whatever that country may be. This has been our stark experience in the recent past. This does not, however, mean we should not explore joint initiatives for mutual benefit,” he said.